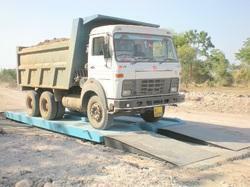 Leading Manufacturer of computerized electronic weighbridge from Pune. Ours is a reputed organization that is engaged in offering Computerized Electronic Weighbridge.These weighbridges provide reliable, accurate and easily understandable weighing information. Offered weighbridge have sturdy platform design for ensuring reliable performance, high precision, easy installation, longer service lives. These are useful for power projects, biomass projects, warehousing, and construction site. Looking for Computerised Electronic Weighbridge ?